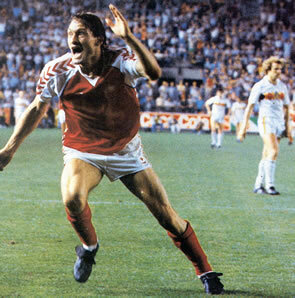 Preben Elkjaer Larsen was a hard-running forward of exceptional skill and flair. Although his potential was obvious from an early age, a move to Cologne at just 19 years old proved too soon as he was unable to adapt to the discipline of playing for a major German side. There is an anecdote that tells of how, when quizzed by coach Hennes Weisweiler if it was true Elkjaer had spent the evening in a nightclub with a bottle of whisky and a lady, Ekljaer replied ”no, it was a bottle of vodka and TWO ladies”. He left the club after just 9 league appearances. Ekljaer was to find greater success in Belgium with Lokeren and it was this, coupled with an impressive performance with the so-called Danish Dynamites at Euro 1984, that secured his move to Italian football with Hellas Verona. What followed is one of the most remarkable achievements of the last 30 years in major club football as Elkjaer, in his first season, led Verona to their one and only Scudetto in 1984-85. They saw off the challenges of the Milan and Turin giants, losing just twice all season, with Elkjaer memorably scoring againt Juventus with a run from the halfway line, losing his shoe in the process. He was at the peak of his powers and was voted Europe’s 3rd finest player in 1984, behind Michel Platini and Jean Tigana, and following it up in 1985 by missing out only to Platini (again) in the Ballon D’or voting (the award is courtesy of France Football magazine). Elkjaer’s finest hour on the International stage was to come at the 1986 World Cup in Mexico. FIFA voted him the 2nd best outfield player in that World Cup behind Diego Maradona. A brilliant hat-trick against Uruguay lit up the tournament but the Danes were to implode against Spain 5-1 in the knockout stages and Elkjaer was to finish his international career without a trophy. Indeed, it is a bizarre footnote that Denmark won Euro 92 without their golden generation of Elkjaer, Simonsen, Arnesen, Laudrup, Olsen & Molby. Nice stats, but isnt a bit high AGI? Balance looks to high (maybe 86) and acc a bit low, he could surpass his opponents very easy (I propose 91). Tech at least 86 very soft first touch and DA maybe could go ap to 89, very succesful dribbler.